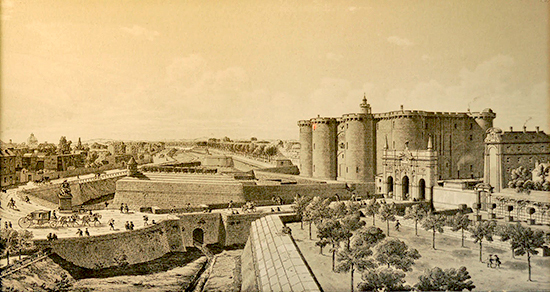 The word bastille derives from bastion, Latin for fortress, tower. Hence, bastille, also spelled bastile, can refer to any small fortress. 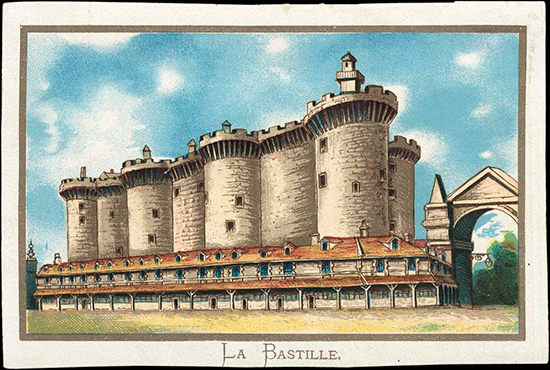 However, the Bastille was a fortress in Paris located at the St Antoine gate. It was also used as an arsenal and a prison. Thus, by extension, the word bastille can sometimes also refer to a prison. 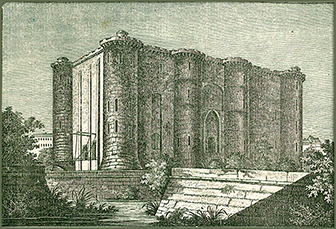 The Bastille had eight towers, which were 73 feet high and six feet thick. It was armed with 15 cannons, and connected with walls that were 10 feet wide. A 25 ft deep moat surrounded the Bastille. The moat was dry, except during floods of the Seine. Each tower had its name. The Chapel Tower and the Treasury Tower were built first. Soon after, the Liberty Tower and the Bertaudière Tower were built. Then added were the Corner Tower and the Well Tower, and lastly the County Tower and the Basinière Tower. Although the same height, the towers of the Bastille did not have the same number of floors. Treasury and Chapel had only two floors and no dungeons, whereas Liberty and Bertaudière had three floors and dungeons. 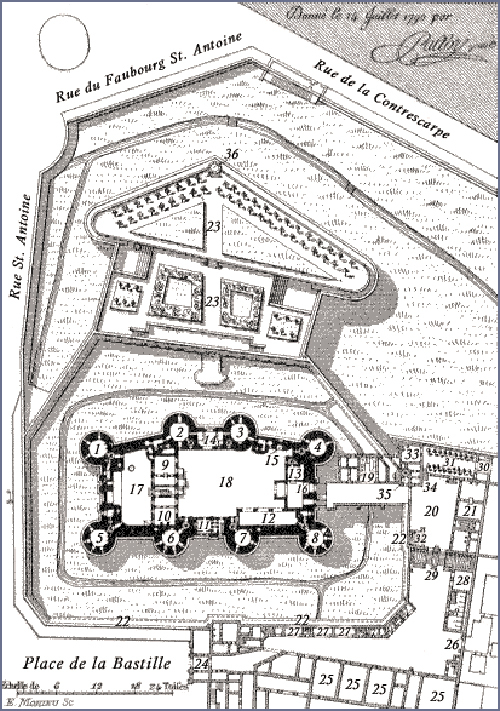 The four corner towers, Corner, Well, County, and Basinière, had five floors of jail cells. 1 Corner Tower. 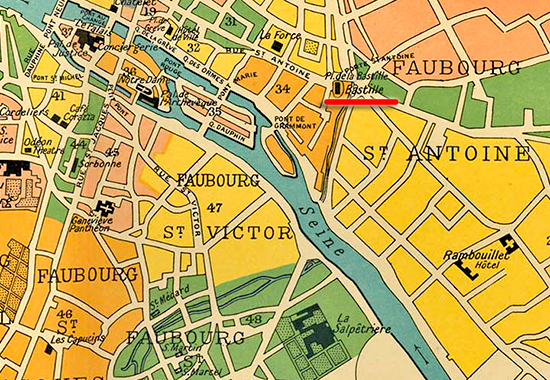 Obviously, this tower received its name from its location at the corner of rue Saint-Antoine. 2 Chapel Tower. In the fifteenth century, the chapel of the Bastille was set up in this tower. It was afterwards transferred to a spot between Liberty Tower and Bertaudière Tower. 3 Treasury Tower, so named when Henry IV stored his savings here in order to create a state treasury. Outside, between Chapel and Treasury Tower, was still visible the arch that was the first gate of Saint-Antoine. 4 County Tower. The origin of the name of this tower is unknown. 5 Well Tower. The well of the Bastille had been dug at the foot of this tower. 6 Liberty Tower. The name of this tower was given in a slightly sarcastic spirit around 1380, when the Parisians demanded freedom and at the same time the provost of Paris, Hugues Aubriot, was locked up. At the floor of this tower was the interrogation room, which might or might not have ceased to be used as such when Louis XVI officially abolished torture. 7 Bertaudière Tower. This tower was named after the mason Bertaudière, who was killed falling from the platform during construction. Its third floor was used as the prison for the Man in the Iron Mask. 8 Basinière Tower. This tower was named after a prisoner that was locked up here in 1663, a Sir de la Basinière, who was Treasurer of Savings. 9 Council Chamber. 10 Library. 11 Chapel. 12 Archives. 13 Guard. 14 Old city gate. 15 Door from the bastion. 16 Drawbridge to the entrance. 17 Court of the well. 18 Large yard. 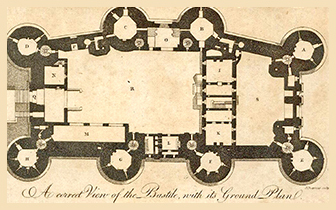 The Chapel, Treasury, Liberty, Bertaudière, County, and Basinière Tower led to a courtyard 120 feet long and 72 feet wide. 19 Kitchens. 20 Court government. 21 Housing of the governor. 22 Trail round. 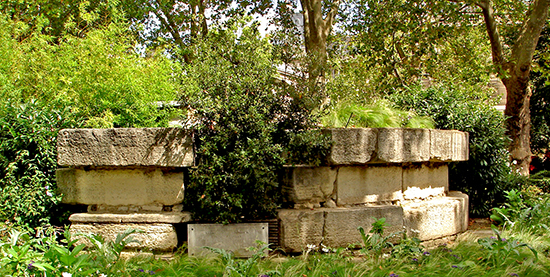 23 Bastion and garden. 24 Gateway of the passage. 25 Invalids under the armory. 26 Door to the elm courtyard. 27 Special shops. 28 Stables and outbuildings. 29 Advanced drawbridge. 30 The garden gate of the arsenal. 31 Terrace and promenade. 32 Guard of advance. 33 Belvédère and parlor. 34 Moat staircase outside. 35 Moat staircase inside. 36 Dungeon. When and Why Was the Bastille Built? Building of the Bastille commenced on April 22, 1370, under Charles V in order to protect against the English (see also the Hundred Years' War). Provost of Paris at the time was Hugues Aubriot. The Bastille was completed in 1383 under Charles VI, who could be sane at times. During the 16th and the 17th century, the Bastille was expanded. The Bastille had been occasionally used as a prison from the beginning. It was transformed into a state prison in 1417. The Bastille became a fortress of great importance. Under Louis XI, who lived 1423-1483, the Bastille was considered to be the key to the capital. All eight towers were complete in 1553. Later, when the faubourg or suburb of Saint-Antoine was built, the Bastille was surrounded by houses and completely lost its military value. It henceforth became Paris' most fortified arsenal and prison, which meant that at this point the citizens grew to fear and hate the Bastille as a constant reminder of a threat to their liberties. Most notorious were the underground dungeons that were basically graves only with a tad more oxygen. The Bastille was fully converted into a prison during the seventeenth century, and especially with Richelieu, who lived 1585-1642, it was in regular use. 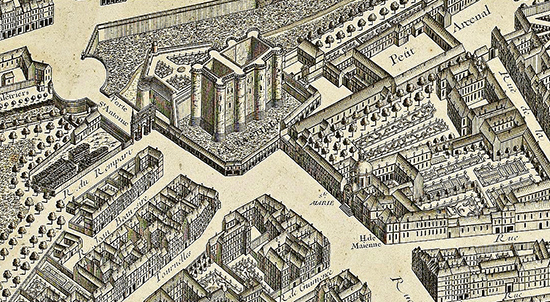 Under Louis XIV, who ruled 1643-1715, the Bastille prison cells were in good demand. Protestants, followers of Cornelius Otto Jansen, spies, unwanted nobles, bourgeois, merchants, assassins, thieves, magicians, booksellers, peddlers, men of letters, anyone accused of treason or lese-majesty (any offence against the sovereign authority) and other culprits whose public prosecution might have triggered too many raised eyebrows, populated the Bastille. 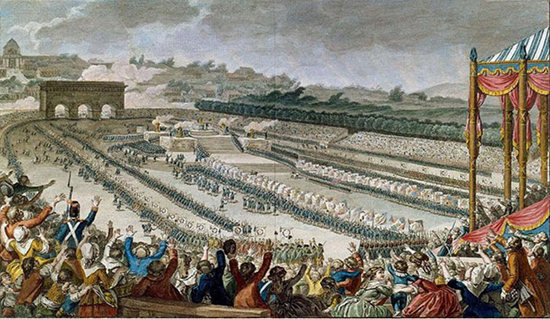 During the second half of Louis XIV's reign, quite a few people ended up in the Bastille without having done anything. All that was needed to put your enemy or relative of choice away — for a limited time or forever — was a Lettre de Cachet, a Letter of Seal, which was a document with the king's signature, co-signed by a Secretary of State, and made official by the royal seal. Under Louis XIV, more than 80,000 lettres de cachet were signed. This document was a final verdict without the option of an appeal. 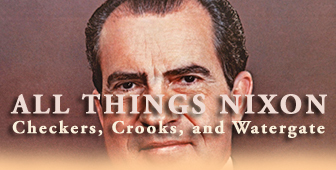 No trial, no hearing, no questions asked. Welcome to royal absolutism. and who was consequently given solitary time to re-think his mockery. 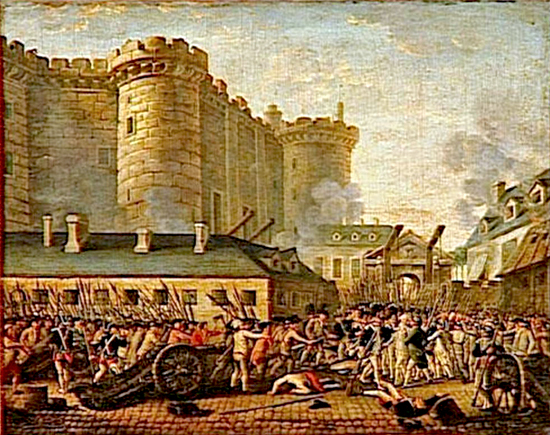 In 1741, the Bastille housed 71 prisoners. In 1755, it were 50. Under Louis XVI, the last king before the Revolution, the Bastille booked less traffic. The annual admission was approx. 16 new prisoners, many of which didn't stay for long. One of the last prisoners at the Bastille was the Marquis de Sade (picture left,) who stayed at this address from 1784 to 1789. De Sade was transferred away ten days before all hell broke loose. Generally feared, the Bastille was a symbol of royal tyranny and arbitrary rule. 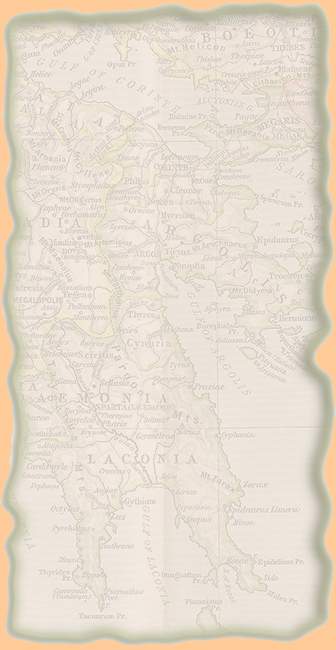 Already on the night of June 30, 1789, there was some talk of seizing this fortress. Now, word had spread that on the night of July 12, 1789, ammunition had been transferred to the Bastille. On the evening of July 13, 1789, some shots were being exchanged between the mob and the guards of the Bastille. 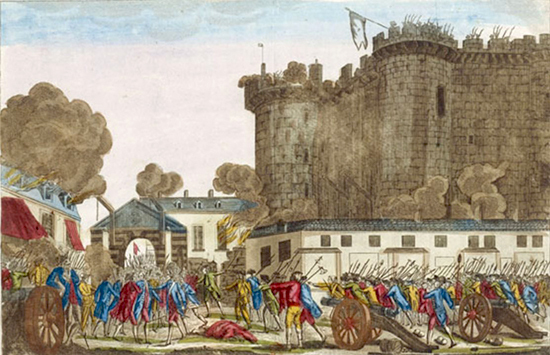 The Bastille was stormed by the revolutionaries on July 14, 1789. Defending the Bastille were 32 Swiss and 82 Invalides (pensioners,) all in all a garrison of 114 men. Led, of course, by the prison governor, Bernard Jordan de Launay, whose head was going to be on a pike later that day, the first of many more to come during the course of the French Revolution. On that day, July 14, 1789, only seven prisoners were held at the Bastille, four of which for counterfeiting, and one completely nuts. The Fall of the Bastille marked the beginning of the French Revolution. The upkeep of the Bastille had been expensive. This fact and the recent revolutionary events made the monarchy decide to tear down the entire structure. 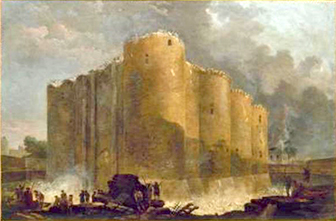 Dismantling of the Bastille commenced immediately and was entrusted to the contractor Pierre-François Palloy. Many volunteers pitched in enthusiastically and the Bastille was completely bulldozed by 1790. Hubert Robert sketched a painting of the Destruction of the Bastille, dramatically drawing the Bastille much larger than it actually was, which, in turn, gave its demolition much more significance. See his painting in the right column. 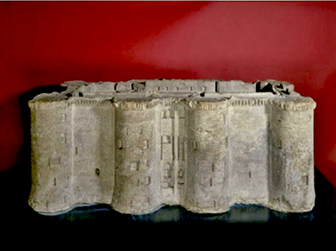 As in the case of the Fall of the Berlin Wall, many souvenirs were taken from the Bastille. Pieces of brick were sent all across the country, triggering much patriotic happiness wherever they were received. In summary, if you are planning a visit to the ruins of the Bastille, don't. They don't exist. 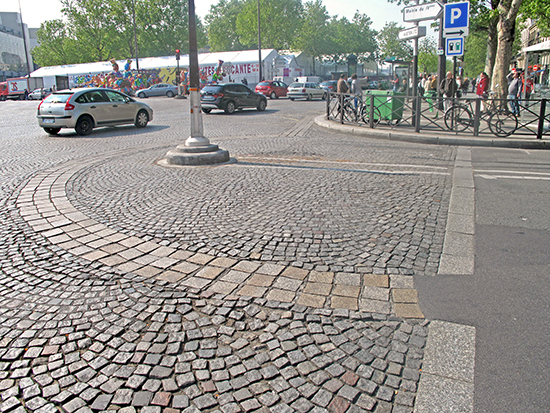 What's left of the Bastille is the outline of the structure, marked in the pavement. Here is a photo of the corner Rue Saint-Antoine / Boulevard Beaumarchais. Just to give us an idea. Own work, so let's not get excited. 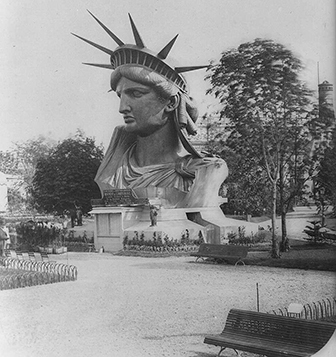 In 1899, during construction work for the Metro, some remains of the Liberty Tower were found and brought to the park just down the road on Boulevard Henry IV. In 1793, the Bastille square was adorned with a fountain. Later, Napoleon decided that something a little bit more monumental should be erected there in order to commemorate the anniversary of his coming to power. 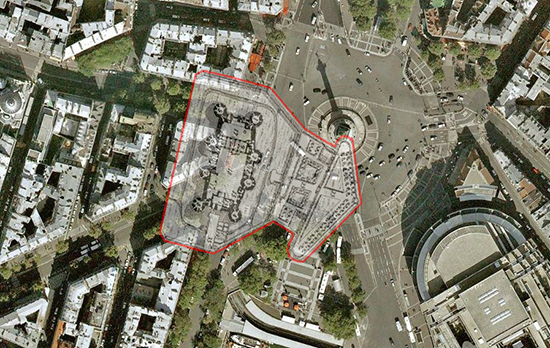 Hence, from 1814 to 1846, the center of the Place de la Bastille was occupied by a gigantic plaster elephant fountain. The idea was to replace it with a bronze elephant, but after Napoleon's defeat the project was not followed through. After the Revolution of 1830, the entire elephant project was completely canceled in favor of the July Column. 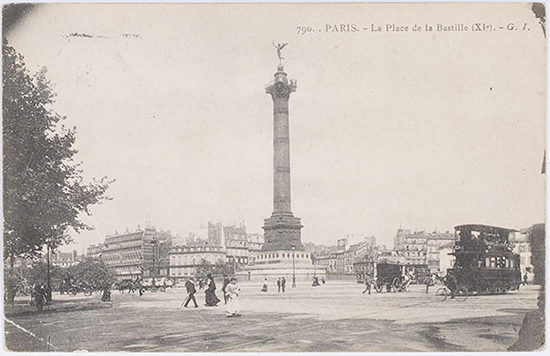 The above July Column still stands today in the center of the Place de la Bastille. 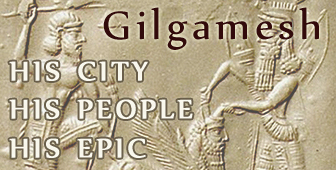 It commemorates the Revolution of 1830, not the Revolution of 1789. By the way, the water that runs underneath the Place de la Bastille is the Saint-Martin Canal. 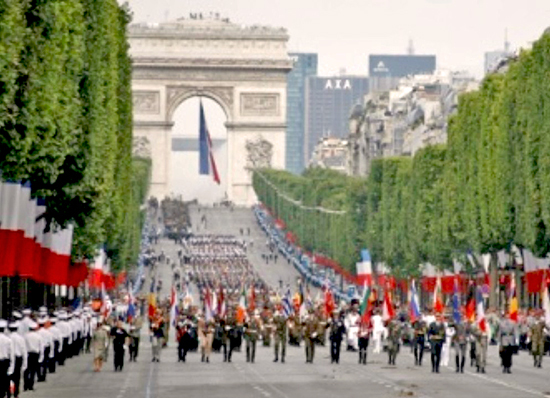 The commemoration of July 14, 1789, was abandoned until the Third Republic, spearheaded by Gambetta, sought to celebrate the foundation of the regime. 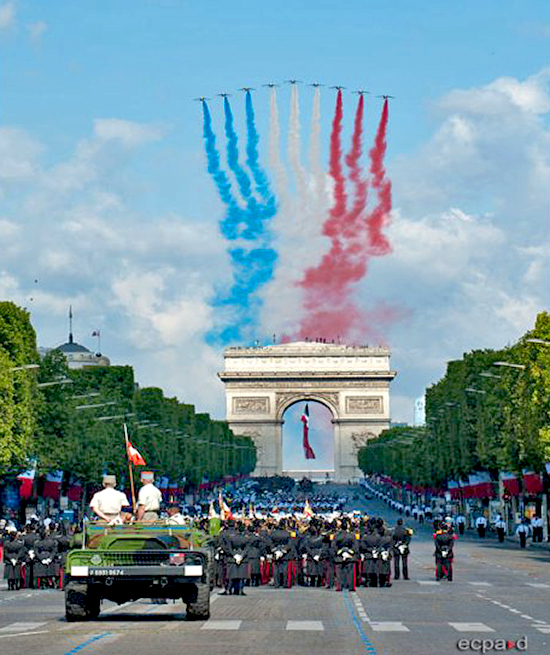 Since 1880, July 14 is Bastille Day, but officially called the Quatorze Juillet, or Fourteenth of July. 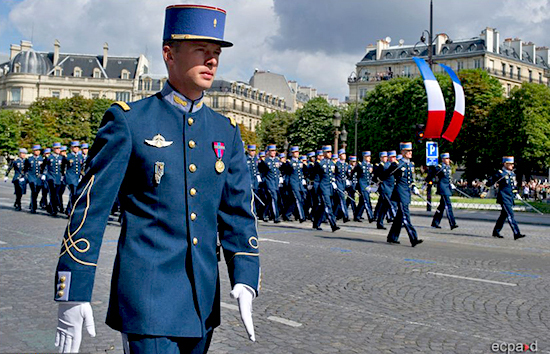 It is a national holiday in France with military parades, fireworks, dance, live music, food, and whatever else entertainment the French soul can come up with. The festival begins on the evening of July 13 with a torchlight procession. Hence, from a symbol of repression the Bastille became a symbol of liberty. 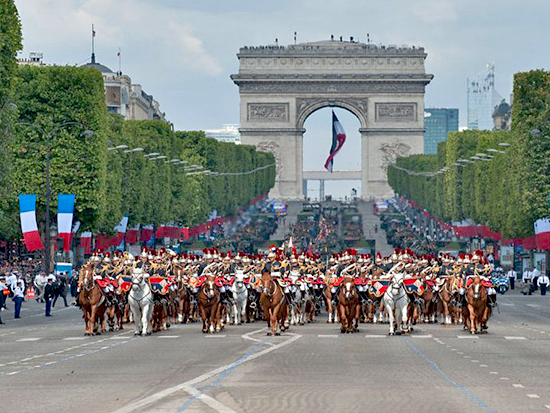 To be technically correct, the July 14 festivities commemorate the Fête de la Fédération or Celebration (Festival) of the Federation of July 14, 1790, the first anniversary of the Storm of the Bastille. 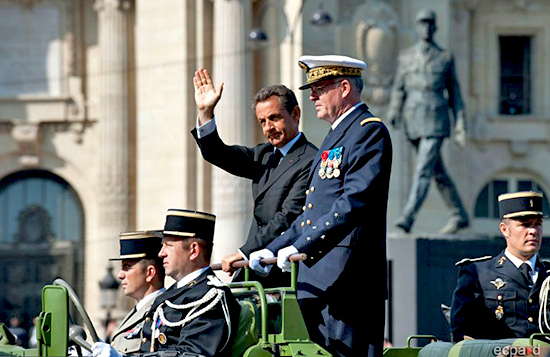 the Chief of Staff of the Army on board the command car. How much the greatest event it is that ever happened in the world! and how much the best! from the original Bastille. Unknown artist. Non, Sire, c’est une grande rèvolution. Ironically, its founder became its first prisoner. When Charles V died in 1380, the provost Hugues Aubriot lost his greatest supporter and protector. Aubriot's political enemies imprisoned him at the Bastille in 1381. He then was transferred to the For-l'Évêque prison, where thanks to the Maillotin Uprising, Aubriot managed to escape. The Maillotins wanted him as their leader, but he kindly declined and took the opportunity to leave town with the quickness. The list of captives is long. Among the most famous prisoners of the Bastille were, in addition to the already mentioned Voltaire and de Sade, Antoine de Chabanne, the Duke de Nemours, the Maréchal de Biron, Fouquet, Pélisson, Rohan, Lally-Tollendal, the Maréchal Duke de Richelieu, the Abbot de Bucquoy, Latude, and the famous prisoner in the iron mask. The treatment of the prisoners was as arbitrary as their condemnation, often depending on the greed level of the prison guards. But not always. Many prisoners of the nobility enjoyed great favors due to orders from higher places. 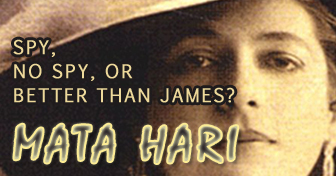 They could keep their officers, their secretaries, and their servants. They were allowed to promenade in the garden, their table was well served, and the prison governor addressed them hat in hand. Other, more unfortunate, souls were left to rot in the dungeons, their identity long forgotten and their letters never mailed. Some were chained up by hands and feet, and — if really unlucky — during the flood of the Seine, up to their necks in water. The name of the person who cut off the head of the Marquis de Launay, last prison governor of the Bastille, on July 14, 1789, was Desnot, a butcher or a pastry cook. Either way, the man brought his own trusty kitchen knife to the event. De Launay was surrounded by a mob who was foaming at the mouth. By then, it was each man for himself and hand combat. De Launay dished out and managed to place a crisp kick in Desnot's crotch. That was all the mob needed and they let it hail all sorts of sharp and blunt objects upon de Launay, following up with a few pistol shots for good measure. Desnot was given the honor. He cut off de Launay's head, put it on a pike, and used it as a very inspiring lead parade mascot. 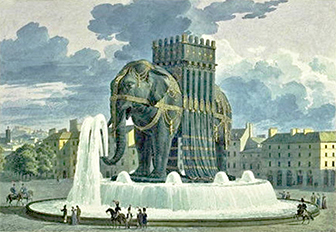 Above aquarelle is the latest draft of the fountain of the elephant for the Place de la Bastille, drawn by French architect Jean-Antoine Alavoine, who lived 1776-1834. Napoleon had it envisioned to be cast in bronze. An interior staircase would lead to the top. However, a temporary plaster elephant was all the Parisians would ever see. After Napoleon's defeat, the monument was rotting away, much to the delight of the city's rats. 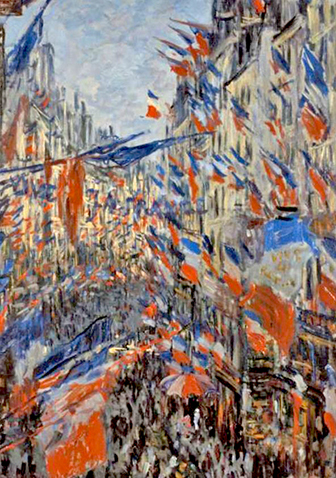 Like its twin painting The Rue Montorgueil, Claude Monet's Rue Saint-Denis is often thought to depict a July 14 celebration. In fact, this painting illustrates the celebration of the Exposition Universelle, Paris' Universal Exposition and World Fair, on June 30, 1878. The fair took place every 11 years. The one in 1878 was the third fair of its kind and was held from May 1 to October 31, 1878, at the Champ de Mars. Famous exhibit, by the way, was the finished head of the Statue of Liberty.